We weren't sure when we were going to be able to leave Playa Ventura. The problem was that they were holding their annual half marathon, and we were parked right near the finish line! So at 7:00am, there was all kind of activity going on. Originally, we had been told it should be all over around 9:00am, but it did not look promising. Out for a walk on the beach before sunrise. We walked back on the road. You can see the sun coming up! This is where we were parked. Right outside was the finish line! We made a plan to leave at 8:45am. I started earlier because it was going to take some maneuvering to get us all our of there. Some vehicles had parked, partially blocking our exit and it was not easy... but we did it! Back on highway 200 heading north. Can you tell we are past the half way point of this trip? We are heading north! Mexico is not always beautiful. Lots of roadside trash in this area. We took the northern bypass around Acapulco. It is not smart to take an RV through the center of Aacapulco, let alone eight of them! Arrived at Acapulco Trailer Park at around 12:40pm. Not bad. Yesterday's drive, 174 kms (108 miles). Sherman and the group at Acapulco Trailer Park. Acapulco Trailer Park has been here since 1968! Ruth and I have spent a fair bit of time here, but we have not been here since 2013, so it is nice to return. Quite a few other people here too, but then today is a National holiday in Mexico and some of them are locals who are tent camping, so they will likely clear out this afternoon. Scarlet the dog enjoys happy hour with us too! Everybody on the beach to watch the sunset. Temperature on this part of the coast is pretty consistent. Highs of 29C (84F) and lows of 21C (70F). Tide Pods Laundry Detergent is on sale... time to stock up! And, there is an extra $3 off coupon showing on top of the sale price! When we lived in Puerto Rico, the "basura" used to drive us crazy. We were forever picking up trash along the beach. One of my wife's associates, who was born in Panama, claimed that it was a "Latin thing". We just thought it was a Puerto Rico thing, but apparently not. We don't believe it is "just" a Latin thing because we have seen it like this in other places around the world. Unfortunately we think it will take a long time before we really notice a difference, at least in this neck of the woods. We have certainly seen a huge improvement in the more northern part of Mexico and in many big towns and cities. Basura is all over the world unfortunately. And foreign governments have litter campaigns. Not helping. Nice campground! Yes, the campground is very beautiful. When we cruised Mexico with our sailboat we would buy purified water in carboys from venders that cruised the docks. Does the same thing happen in RV parks or where you are parked without hookups? In Mazatlan, a couple years ago, the purified water venders came by at least once a day at the airbnb we stayed at. We only drank purfied water. We were told 20 years ago Baja water is safe to drink out of the tap, so is San Carlos, but south of San Carlos only drink purified water. Yes, everybody in Mexico drinks only purified water. Even the locals. Yes, they often deliver it right to you. The container is called a "garrafon" in Spanish. we were in the RV park in 1978. It has changed a little since then. I bet it has changed quite a bit since then. You must have been some of the first RVers using this campground?! We were offline for a week while we were down at Mazatlan and PV, and thinking of you all. Glad you're having a great trip. We hope you enjoyed your time in Mazatlan and Puerto Vallarta. 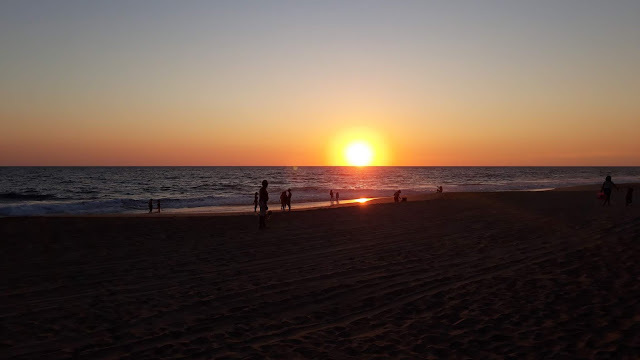 We have been following your blog and it gave us the desire to discover Mexico with our 24ft motorhome. We are presently at Isla Aguada and wondering if we should visit Yucatan and quintana Roo or cut that part out and go down to Huatulco and follow the coast up to Puerto Vallarta . In your opinion is it safe for solo travelors on highway 200? 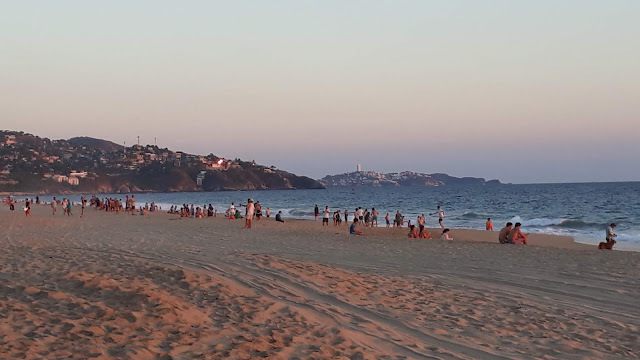 Acapulco area? Kinda of overwhelmed at the moment . Unfortunately, we cannot make that decision for you! We do not think that the Yucatan is worth the extra effort, but that's just our opinion. Others love the constant baking heat! We prefer to be inland in the mountains. Is highway 200 safe for solo travelers? Well, we think so, but it depends on what type of traveler you are. Do you do lots of research so you know the route, or do you just wing it? Do you plan your next stop so that you are confident of your plan? Or do you just go with a paper map and stop at Pemex gas station for the night? If you are an experienced traveler, you are unlikely to have any serious problems in Mexico. You are in the perfect place to continue on to see the Yucatan and you will not regret doing so. You may not get another chance Is Highway 200 and Acapulco safe? Yes, as long as you have a plan, know your route and pay attention to your surroundings, same as you do anywhere you travel. Halfway already - time goes so fast - especially when you’re having fun!!!!! Yes, it is hard to believe isn't it, the time really does fly by quickly!